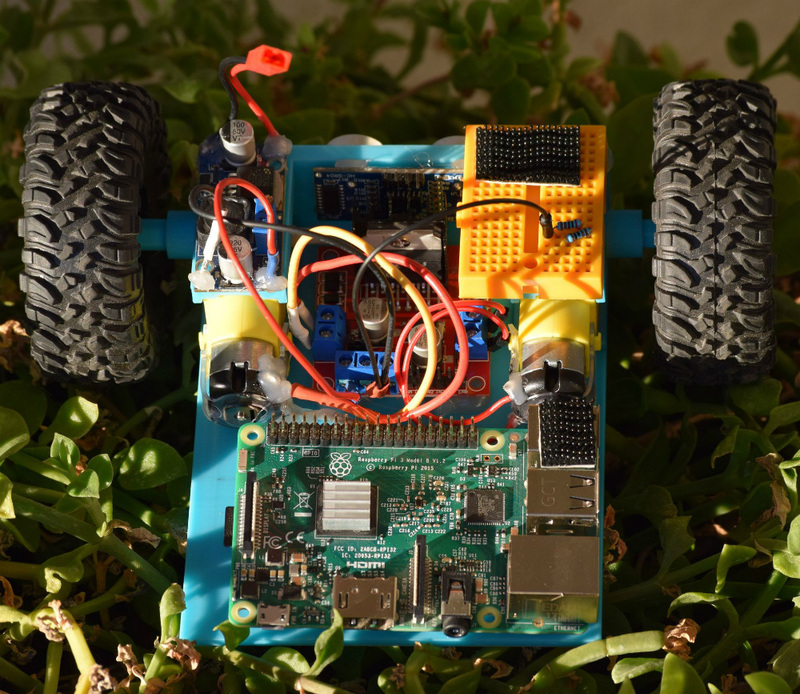 [Miguel] wanted to get more hands-on experience with Python, so he created a small robotic platform as a testbed. But as such things sometimes go, it turns out the robot he created is a worthy enough project in its own right. With a low total cost and highly flexible design, it might be exactly what you’re looking for. Who knows, it might even bootstrap that rover project that’s been wandering around the back of your mind. The robot makes use of an exceptionally simple 3D printed frame. No complicated suspension to worry about, no fasteners to hold together multiple printed parts. It’s just a single printed “L” shaped piece that has mounts for the motors and front sensor board. As designed it simply drags its tail around, which should work fine on smooth surfaces, but might need a bit of tweaking if you plan on taking your new robotic friend on an outdoor adventure. There’s a big open area on the “tail” to mount a Raspberry Pi, but you could really put whatever board or microcontroller you wish here. In the nose is an HC-SR04 ultrasonic sensor, which [Miguel] is using to perform obstacle avoidance in his Python code. A dual H-Bridge motor driver controls the pair of gear motors in the front to provide propulsion and steering, and a buck converter steps down the 7.4V from the 2S LiPo battery to power the electronics. He’s even included a mini breadboard so you can add circuits or sensors as experimental payloads. If you’re looking for a slightly more advanced 3D printed robotics platform, we’ve seen our fair share. From the nearly fully printed Watney to a tank that looks like it’s ready for front-line combat. More than $100 in parts isn’t too low-cost. True, good thing this doesn’t even cost half that. About $30 by my math. Unless your counting the Pi too in which case it: A. Still isn’t $100, B. Not required because the point is you can drive it with whatever board you want. -Motors 4x listed at $13, but only 2 pcs needed? As listed, $102 in parts. Wheels and Tires were omitted, so add $5? Maybe you could search for cheaper parts that would reduce that $100 buy list? So that’s only $97, doing good! Maybe you already have some of this stuff…. that would make it cheaper…. Dr. Cockroach wrote a comment on project log Fifty Shades Of Guano. Tom Dowad has updated details to InstaBeat LE MP3 Player. Ryan J. Dillon liked A noise-free infrared obstacle detection . Ryan J. Dillon liked ulx3s . Juan Gonzalez-Gomez liked ulx3s . c.Invent has updated the project titled FunKey project - All your games on your keychain !. Mic liked Multi game retro console with CPU on μSD cards. Morning.Star has updated the project titled Starcrete.